Last year I mentioned that I had three great academic moments while in college. The first pertained to a poem that I wrote. The second (and perhaps my favorite) pertained to a Toni Morrison novel. My first English class at Trinity College was Feminist Literary Criticism. Four female students plus me sitting around a table with a middle aged female professor who scared the hell out of me. Our first novel: To the Lighthouse by Virginia Woolf. I have never liked Virginia Woolf’s work, an opinion that was treated as sacrilege by at least two of my English professors in college. Worse still, I had difficulty understanding Woolf’s work. Fresh off a three year run at Manchester Community College which culminated in membership on the USA Today Academic All American Team, I assumed that my string of academic successes with undoubtedly continue with my arrival at Trinity. Then I began reading To the Lighthouse, and despite my best efforts, could not make sense of the book. To the Lighthouse is a landmark novel of high modernism. The text, centering on the Ramsay family and their visits to the Isle of Skye in Scotland between 1910 and 1920, skillfully manipulates temporality and psychological exploration. Hard to follow. Little dialogue. Almost no action. Who writes something like this? Worse still, the size of the class prevented me from disappearing into the background. Sitting around a table twice a week with four hyperbolic feminists and a professor with a passion for Woolf, I knew that I was not going to be able to avoid reading the book without being noticed. In fact, I nearly switched over to economics during my first week at Trinity as a result of this class, which might have been a more profitable decision in terms of future earnings but considerably less satisfying overall. But I decided to stick with it, determined to one day be a writer. It was only through my knowledge of the Internet that I survived those first three weeks of Virginia Woolf. It was 1996, and while the Internet was well on its way to becoming fairly ubiquitous, it was still in its infancy. Google did not yet exist. Wikipedia was years away. Search engines like Lycos and AltaVista were dominating the tiny search market. For the most part, only nerds and geeks had a complete understanding of the Internet as it existed back then, and they were the only ones capable of fully harnessing its power. I was one of those geeks. So rather than reading the book, I skimmed the book, seeking out every pronoun in the text unrelated to the characters and setting and then using the Internet to learn everything about them. Woolf had filled her book with literary and historical references, and I became the guy who knew everything there was to know about these references. To a teacher who had absolutely no understanding of the Internet and four young women whose knowledge was only a smidgen greater, it appeared as if I was spending hour upon hour in the library, researching the references that I was encountering as I read the book. I never spoke a word in those discussions about anything except my nuggets of literary research, and while I went on to read the rest of the assigned novels that semester and ultimately receive an A in the class, I managed to scrape by the first three weeks of my Trinity College experience thanks to my understanding of a burgeoning little network known as the Internet. 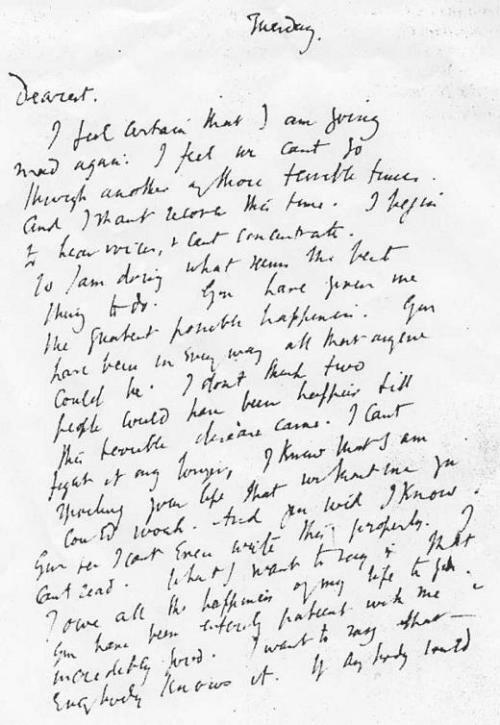 I have not attempted to read another Virginia Woolf novel since that class, but I stumbled upon the suicide letter that she wrote to her husband before she filled her pockets with stones and drowned herself in a river. While her handwriting was atrocious, I was pleased to see that it was I was able to read her prose just fine. It’s actually a heart-wrenching letter that left me wondering how her husband managed to go on after reading it. Virginia Woolf: crushing men’s spirits no matter what she is writing. Tuesday. Dearest, I feel certain that I am going mad again. I feel we can’t go through another of those terrible times. And I shan’t recover this time. I begin to hear voices, and I can’t concentrate. So I am doing what seems the best thing to do. You have given me the greatest possible happiness. You have been in every way all that anyone could be. I don’t think two people could have been happier till this terrible disease came. I can’t fight any longer. I know that I am spoiling your life, that without me you could work. And you will I know. You see I can’t even write this properly. I can’t read. What I want to say is I owe all the happiness of my life to you. You have been entirely patient with me and incredibly good. I want to say that - everybody knows it. If anybody could have saved me it would have been you. Everything has gone from me but the certainty of your goodness. I can’t go on spoiling your life any longer. I don’t think two people could have been happier than we have been. V.